Larry Page and Servey Brin were brilliant not only with their technology solutions, but in how they found where they could make an important contribution, knew their competition, realized their strengths and addressed their weaknesses, and in time developed a compelling business model. This article doesn’t address the strategic reasons for Google’s success, which are compelling and merits attention. Rather, this article focuses on the business management principles that are foundational to Google’s success. Larry Page and Servey Brin, the co-founders of Google, were Ph.D. students at Stanford University. Larry observed on the web how unproductive it was to just follow one link from one webpage to another. He thought it would be help to know who was linking to whom on the web. Larry decided to try and count and qualify backlinks on the web. Jim’s team came to simple but powerful conclusions. One important point they make is referred to as the ‘hedgehog’ concept. 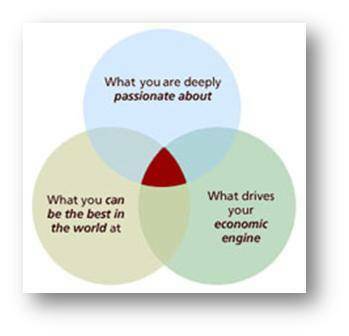 A key to greatness is finding the intersection, referred to as the sweet spot, between your talent, passion, and economic opportunity. Jim’s diagram below helps to illustrate these points. Most businesses are focused on making money first. Is money a strong enough motivator to create tremendous value to customers? Google’s passion is to make all information in the world instantly available to everyone. They envision how that focus will facilitate important breakthroughs in countless areas. What you can be the best in the world? What drives your economic engine? In other words, how can you focus on your passions and talents and make a living?